5/25/2018 I just got into Sunless Sea in earnest (was waiting for a good sale on Zubmariner) and have read that I should create and link a Fallen London account for the most benefit. In the current game client (2.2.2.3130) I am unable to link my Fallen London account to Sunless Sea. In the options>account authentication menu I just get the error that I need to use the latest game client. I've tried updating to the Unity steam beta, but have the same issue, so I downgraded back to stable. I just got into Sunless Sea in earnest (was waiting for a good sale on Zubmariner) and have read that I should create and link a Fallen London account for the most benefit. 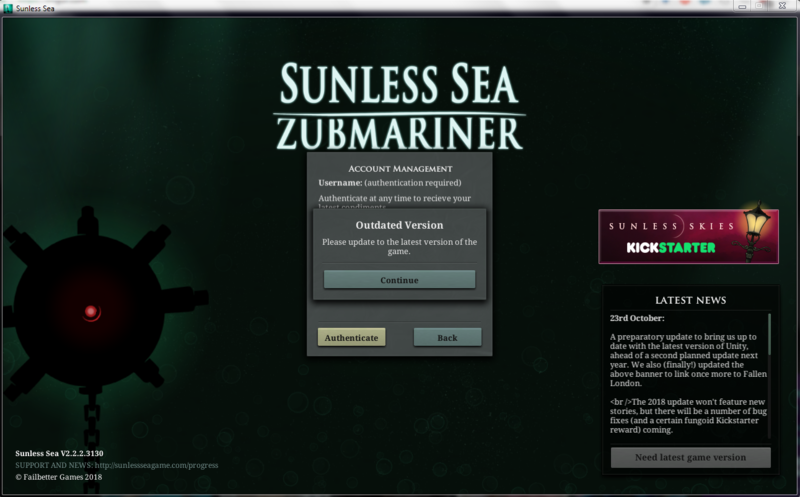 In the current game client (2.2.2.3130) I am unable to link my Fallen London account to Sunless Sea. In the options>account authentication menu I just get the error that I need to use the latest game client. I've tried updating to the Unity steam beta, but have the same issue, so I downgraded back to stable. I had the same problem, and I think I just solved it. 5/26/2018 I already created the account and have the whisper locked box in fallen london. I am working on the Wolfstack docks opportunity and getting a Parabolan Kitten. I guess I will have to wait until Christmas for the Sacksmas stuff. Whenever I open Sunless Sea and go to Optiions>Authenticate (where I should be able to put in my Fallen London info) and I get an "Outdated Version" error. I have tried updating to the Beta and downgrading to the non-Zubmariner clients and still get the same error persistently. 6/2/2018 i've been having the same problem. i just bought Sunless Seas on steam, i want to account management to link it to my Fallen London account and it tells me that the version i just downloaded from steam is out of date and needs updating but according to steam no updates are available. 6/4/2018 Hello! Not being able to link your Fallen London account to Sunless Sea is due to preparations on our end to put a new build live later this week. The build includes mostly bug and typo fixes, but involves some content, which is why it's currently not an option to fully update on Steam. As soon as the build goes out on Wednesday 6th June, this should be fixed! Hope that day has arrived! 10/13/2018 Still no dice and unable to authenticate. Any ideas?